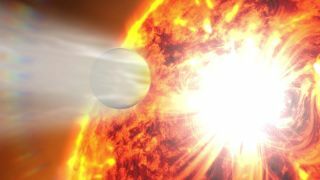 Artist's concept of an evaporating "hot Jupiter" exoplanet. The strength of an alien world's magnetic field may have been deduced for the first time, by analyzing extraordinarily fast winds slamming against it from the planet's star, researchers say. This research could help gauge the strength of other exoplanets' magnetic fields as well, scientists say. In order to find out magnetic details about exoplanets — planets beyond our own solar system — Kislyakova and her colleagues investigated HD 209458b, which orbits a sunlike star in the constellation Pegasus about 150 light-years from Earth. This alien world is only about 70 percent the mass of Jupiter, but nearly 40 percent wider. HD 209458b is a "hot Jupiter," a gas giant that orbits its star closer than Mercury does to the sun — specifically, HD 209458b circles its star at a distance of less than one-twentieth the distance between the sun and Earth. The extraordinary roasting that HD 209458b endures makes its atmosphere blow away like the tail of a comet. Astronomers have informally dubbed the world "Osiris," after the Egyptian god torn to pieces by his evil brother Set. The researchers used NASA's Hubble Space Telescope to analyze the spectrum of light from HD 209458b as it passed in front of its star. Oddly, the data revealed hydrogen atoms moving away extremely quickly from the exoplanet in a lopsided manner. To help explain the unusual way in which the hydrogen is blowing off HD 209458b, the scientists built a 3D model to account for all the known interactions between planetary atmospheres and stellar winds, the flow of particles that stream off stars. The model suggested the exoplanet had a magnetic field about 10 percent as strong as Jupiter's, and that the stellar wind blowing onto the planet was moving at about 895,000 mph (1.44 million km/h). "The implication of these findings is improvement of our understanding of the worlds outside the solar system — some new light shed on bodies many light-years away from us," Kislyakova told Space.com. These findings support prior research suggesting that hot Jupiters have relatively weak magnetic fields compared with their cooler gas giant cousins. Since hot Jupiters orbit very near their stars, they experience powerful gravitational pulls that likely slow the rates at which these hot Jupiters spin. This slower rotation should result in weaker magnetic fields, because a planet's magnetic field "is generated most effectively in fast-rotating cores of planets," Kislyakova said. The scientists detailed their findings online today (Nov. 20) in the journal Science.